Uncle Sam giveth, and Uncle Sam taketh away. 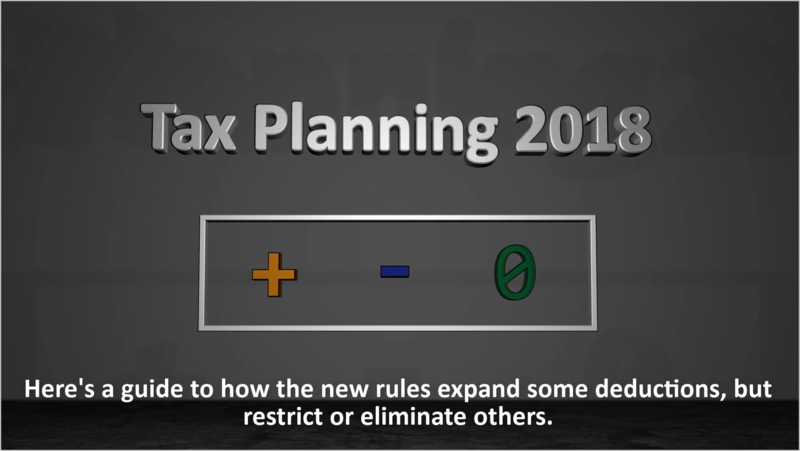 The new federal tax code, which went into effect in 2018 and affects the return you'll file in spring 2019, lowers taxes by expanding some deductions, but restricts or outright eliminates others. Deductions lower your taxable income so you pay less tax. Here's how deducting items from your income were expanded, restricted, or eliminated. Standard deduction. The standard deduction is the amount you can subtract from your taxable income if you don't itemize - that is, individually deduct items like mortgage interest, charitable donations, and car loans. Nearly doubling the standard deduction to $24,000 for joint filers and $12,000 for singles pushes it up from $12,700 and $6,350, respectively. Fewer than half of taxpayers who itemized their 2017 return are expected to itemize their 2018 return. If you file using the standard deduction, preparing your return will be much simpler. If the standard deduction is less than the total of your itemized deductions, you'll still want to file by itemizing, subject to the rules below. Medical expenses. If you itemize deductions, medical expense deductions will be more generous. For tax years 2017 and 2018, medical outlays in excess of 7.5% of your adjusted gross income are deductible. Starting in 2019, the threshold rises to the previous level of 10%. Congress is widely expected to consider extending the 7.5% threshold or making it permanent. Alternative minimum tax. This very unpopular parallel tax system has been reined in and will zap fewer Americans in 2018. The AMT started in 1982 as an effort to reduce loopholes open to ultra-high-income earners, but its net gradually spread and it affected more individuals. In the 1990s, Congress hiked the AMT tax rate, stiffening its cost. Under the AMT, the standard deduction and deductions for state and local income taxes are lost. With the new law, your exemption - the amount you can subtract from your AMT liability - is much larger. Previously, $54,300 was exempt for a single-filer and $84,500 for a married couple filing jointly. Respectively, the exemptions increased by almost a third, to $70,300 and $109,400. Child tax credit. This actually is not a deduction against your income. It's a credit on your tax bill. A credit reduces your tax bill dollar for dollar. The credit for children under age 17 was raised to $2,000 from $1,000. State and local taxes. Lawmakers placed a $10,000 cap per return on deductions for state and local taxes (SALT). Till now, the amount you could deduct for SALT levies was unlimited. If you live in a place with high state and local taxes and home prices, you're hit hard. If you earn more than $100,000 in adjusted gross income and live in California, Connecticut, Maryland, New Jersey, New York or Oregon, you're very likely to see a material hike in your annual federal tax liability for at least the next decade. Mortgage interest. You can continue to deduct this interest for first and second homes. The change: For mortgages dated after Dec. 14, 2017, only the interest on the first $750,000 of debt is deductible. Before that date, the $1 million ceiling still applies. In places where home prices and, thus, mortgages, are low, that is not as much of a concern. In high-price locales, it is. Home equity interest. You no longer can deduct interest paid on home equity loans, unless it is used to improve the dwelling. Many people use such loans, which are secured by their homes, to pay for college tuition or new cars. If a home equity loan and the mortgage totals more than $750,000, the amount over that limit can't be deducted. Personal exemption. Exemptions, which lowered your income by $4,050 per person - usually family members - are gone. For some families with children over 17, who can't take advantage of the expanded tax credit, the elimination of the personal exemption will be a net loss. Alimony. For divorce and separation agreements made after 2018, alimony payments will no longer be deductible. The deduction is helpful to a paying ex-spouse who is short on funds. Casualty and theft losses. If your house burned down or a crook took your wallet, you could deduct the loss not covered by insurance to the extent it exceeded 10% of your income. Under the new law, only casualty losses suffered in a natural disaster declared by the president are deductible. Job expenses. Continuing education, medical tests and licensing fees previously were write-offs. Not anymore. Moving expenses. Before, you could deduct these if you moved to start a new job and it was a good distance (that varies by circumstances, but typically meant 50 miles away) from your old home. Now, that is gone, unless you are in the military. Tax prep. Depending on the complexity of the return, these fees can amount to more than $500. Uncle Sam no longer will let you deduct them, though.